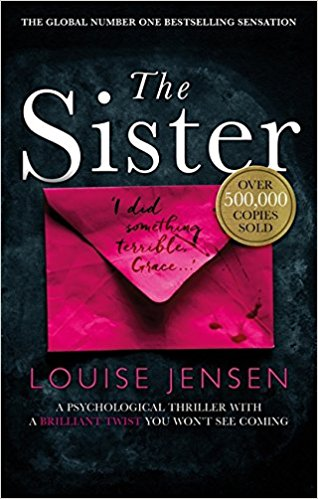 accident when browsing the book section in Tesco where I spotted Sister and was intrigued with the book’s synopsis which showed it was within the domestic noir genre. The book is written in a first-person narrative and from the outset the reader is plunged straight into heart-pounding suspense where we see the protagonist (Grace) alone in the dark woods. The next scene moves to the protagonist’s domestic setting allowing the reader to feel a bit ‘safer’ and out of danger, whilst still being intrigued as to what is in the box that Grace has dug up in the woods. The story centres around Grace trying to find out what it is her deceased best friend (Charlie) is sorry for, and also trying to find Charlie’s birth father. The novel is structured in an alternate present and past/flashback form; taking the reader back to Grace’s school years and letting the reader in on the story’s exposition in an intriguing way. True to its genre, the novel is full of unreliable characters and full of twists and turns, where seemingly small acts of chance are actually not coincidence at all. I absolutely loved this book and couldn’t wait to read the next book by this author. Luckily, as I came across this author a bit further down the line in her career I was able to buy the next book straight away, and her third book came out shortly after. I can’t believe this is a debut novel and accordingly give it a thoroughly deserved ***** (5 star) rating. This novel is currently just £2 for the paperback on Amazon! Bargain go buy it NOW!